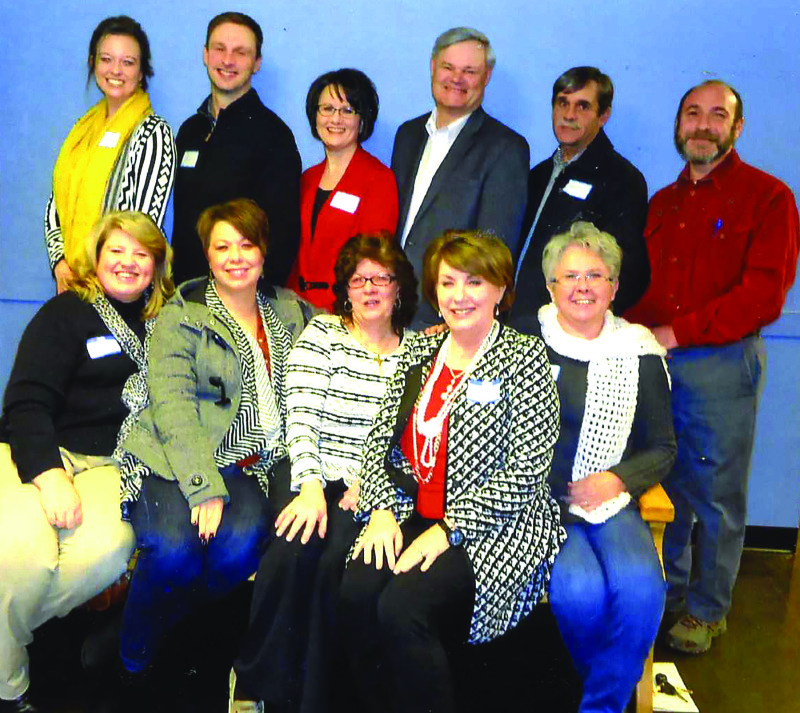 The 2016 Cannon County Chamber of Commerce board members and officers include (back row, from left) Treasurer Cindy Pitts, Phillip Reed, Deborah Shahan, Vice President Gary Hancock, Daryl Fisher and Neal Appelbaum. Front row, from left Connie Rigsby, Tabitha Smith, Martha Whitmore, President Sue Conley and Trish Forst. Not pictured are John Barker, Joann Tate, Debbie Vaughn and Keith Ready. The Cannon County Chamber of Commerce and the Industrial Development Board teamed up to recognize Chamber Members and Industry in Cannon Co. at their annual Mix & Mingle Social held at The Arts Center on Thursday January 21. Those attending which included several county commissioners, city council members, local business owners, IDB board members and Chamber of Commerce officers and board members enjoyed a selection of food items and drink catered by The Blue Porch Catering. A 60-second commercial was offered to everyone who wished to speak along with great door prizes donated by The Arts Center, DTC Communications and Sue & Bob Stancil. Ron Fryar the 2014 & 2015 Chamber President retiring after serving 6 years introduced the 2016 Chamber President Sue Conley, CEO of St. Thomas Stones River Hospital and two new board members, Deborah Shahan, director of The Senior Center and Martha Whitmore with Global Industrial Components. Neal Appelbaum chairman of the IDB introduced the Industrial Development Board members. The Chamber and IDB are working to promote the visibility of Cannon County in order to attract new shoppers, new residents, and new business owners.